Tina Fey appeared in television and print advertising for American Express in July 2008, promoting exclusive travel benefits for Platinum Card® members. 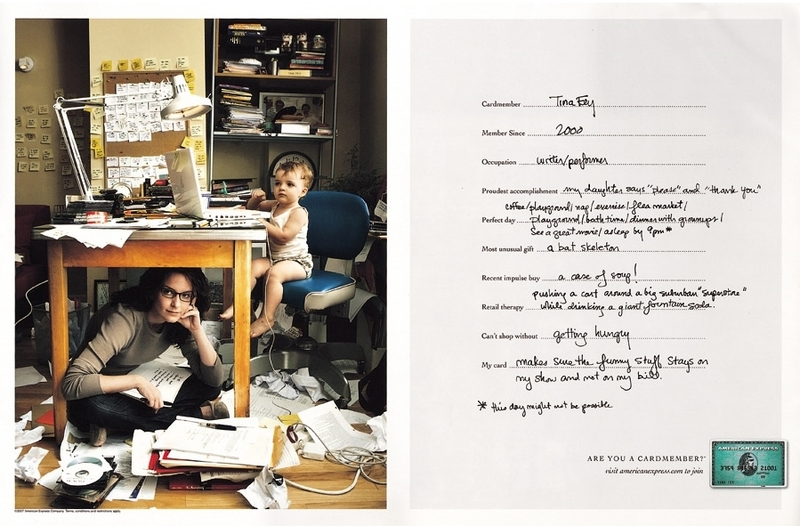 A print advertisement, shot by photographer Annie Leibovitz, portrays Tina as a world traveler and captures her sense of humor about travel. The television spot, part of the American Express “Are you a Cardmember?®” brand campaign, takes place in an airport where Tina has a chance encounter with Martin Scorsese (Call me Marty) who asks her to join him in the airport lounge. Tina’s coach ticket to Paris does not provide access to the lounge and she’s determined to find a way to get in. “Please this is my chance to be kicked to death in a movie!”, she pleads to the lounge staff. A bonus scene from the Tina Fey and Martin Scorseses American Express commercial features an extended cut of their conversation in the airport lounge, where Martin recommends the virtues of Boca Raton to Tina. The extra scene was broadcast in September 2008 during “Live From The Red Carpet: The 2008 Primetime Emmy Awards” on E! The spot drives viewers to American Express Travel’s website: www.americanexpress.com/travel. The Tina Fey campaign was developed at Ogilvy New York, by chief creative officer David Apicella, executive creative directors Chris Mitton and Terry Finley, associate creative director/art director John LaMacchia, associate creative director/ copywriter Simon Foster (TV), copywriter Greg Greenberg (print), executive agency producer Patti McConnell, agency producer Sarissa Karnbach. Filming was shot by director Jim Jenkins via O Positive Films, New York, with director of photography Scott Henriksen and producer Sarissa Karnbach. The print ad won a Gold at London International Awards 2008.